Modern business have become increasingly digital for cloud and data center application, which means everything from sales and marketing to service and support, rely heavily on a fast and reliable network. In 2017, Gigabit Ethernet data rate is no longer adequate to support your business in the ever-developing digital world. Therefore, more and more people nowadays prefers to migrate to 10 Gigabit network. This blog will introduce some basic components of 10G network and how to layout 10GbE within your budget. 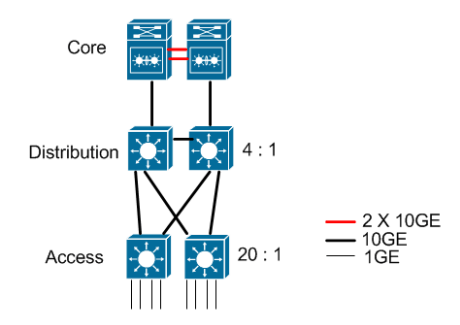 Three expensive but dispensable elements of 10G network are 10G core switches, access switches with 10G uplinks, and 10G network interface cards for severs and storage devices. A 10G core switch might cost you $4000 10 years ago, but today, it heavily drops to under $150 per port. Take Cisco 550X and 350X series switches as the example, they offer a full series of 12, 16, 24, 48 10G ports for small and midsize enterprises nearly at $1,500. Obviously, the price can be pretty lower if you search around. For example, Ubiquiti Unifi and Edgeswitch series switches nearly at $200 are suitable for small businesses. FS S3800-48T4S with 48x 100/1000Base-T and 4x 10GE SFP+ is at $480. For 10G access switches with 10G uplinks, FS S3800-24F4S, S3800-24T4S, S2800-24T4F provides 24 ports with 4 10G uplinks, starting from around $220. A 10G network interface card (NIC) on severs or storage devices cost usually lower depending on the brand. The hot-selling Mellanox ConnectX series NICs are quite cheap on ebay and Amazon (for under $19). 10G Fiber Optic cabling Elements—10Gbase-T, DAC & SFP+ fiber optics? When migrating from 1G to 10G, it is simple. Especially with 10GBase-T supported on your 10G switches, you use the same familiar RJ45 network cable to connect the 10G switch with your servers, storage and other switches, and they go up to the same 100 meters as in the Gigabit network. Just make sure you pick up a Cat6a RJ45 network cable instead of the cat5e or cat6a cables. 1m cat6a cables at FS.COM is $3.4. 10GBase-T technology is becoming more popular in network switches and servers because of its lower cost and ease of use. Besides the cat6a/cat7 Ethernet cables, you can also select SFP+ 10GBASE-T modules with 2.5W power consumption and a maximum distance of 30m. SFP+ 10GBASE-T offered at FS.COM is nearly $380. FS S3800-24F4S (seen in the above image), S3800-24T4S and S2800-24T4F also support 10G SFP+. 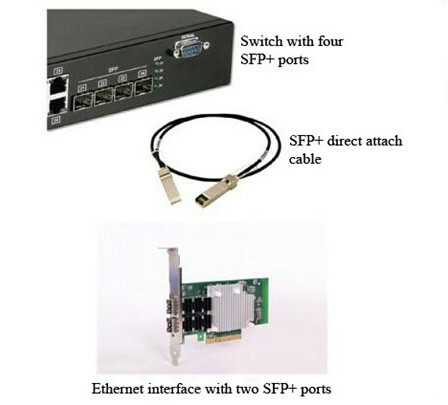 You are recommended to use SFP+ ports if you have existing devices that come with 10G SFP+ port or you need a 10G connection to other switches that are more than 100 meters away. For servers or storage devices with 10G SFP+ port, the most cost-efficient way to connect is to use SFP 10G DAC (direct attach cable). These are basically copper cables with SFP+ connector on both sides, and they come in limited length of 1m, 3m and 5m. 0.5m copper SFP+ cables at FS.COM is $9.5. For switches that are more than 100 meters away, you will need a pair of SFP+ modules and the matching fiber cable between them. Depending on the length required, you can use multimode SFP+ and fiber to reach 400 meters and single-mode SFP+ and single-mode fiber optic cables to reach 10 km. For the reliable 10G devices like SFP+ transceivers and fiber optic cables, you can visit FS.COM. You don’t need to rush your whole network to 10GbE in one step. Just start from the core switches that you use to connect all your access switches together and connect your servers and storage devices. Think about how many ports you need and if redundancy is a concern for you. Having two core switches stacked together to provide redundancy and also extra performance is a good design for a solid network foundation. After upgrading your core switches to 10G, it is time to migrate your key access switches and servers to 10G. You will see immediate performance gain in the most critical parts of your network. The rest of the network can stay as they are for the moment, because 10GBase-T ports are backward compatible with Gigabit links, and 10G SFP+ cage can also work with 1G SFP modules. You can upgrade the rest of your network to 10G whenever you’re ready or in multiple phases if you wish. I bet you must have a good understanding of what’s between the 10 Gigabit high-performance network. The technology is not complicated, especially with FS 10G switches, Cat6a cables, SFP+ transceivers and SFP+ DAC cables. We will help you build a user-friendly and cost-efficient 10G networks. For more information on FS 10G series switches, please contact us directly.